Historically, these exercises have been collectively referred to as "hand balancing" and have been an integral part of strength and health culture since antiquity, yet today hand balancing seems to have followed the passenger pigeon to extinction. Examining the twin questions "what has been lost by this extinction?" and "what does hand balancing offer that makes it essential?" is the aim of this month's Journal. The answers to these questions motivate a challenge for our readers for the New Year. The quick and obvious analysis as to hand balancing's benefits would include improved balance and increased shoulder strength, and though accurate, ending the analysis here doesn't speak to the singularly unique advantages to this training. 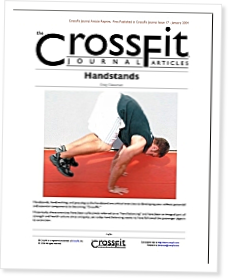 There are countless successful protocols for increasing shoulder strength and balance, but training the handstand and presses to the handstand improves proprioception and core strength in ways that other protocols cannot. Let's examine this claim more closely. Being upside down exposes the athlete to, what is for many, a brand new world.